Probably written for Richard d'Aungerville de Bury, bishop of Durham (1333-1345), this manuscript has a compilation of excerpts from a wide range of classical latin writers, theologians and other sources. The excerpts are arranged alphabetically by their headings, from 'abstinence' (abstenencia) to 'zeal' (zelus). Called a 'tabula' it was probably used as a reference book for different categories of writings, including theology, law, natural science and medicine, although it would also reflect the interests and resources of its patron. 'Benignita' (grace), 'blasphemia' (blasphemy) and 'bona' (good) share this page. A gold initial highlights each heading and a series of excerpts from a variety of authors follows. 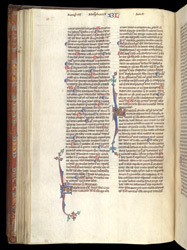 Each excerpt is marked with a red or blue paragraph sign. Red underscores elevate the rank of some of the divisions, creating a hierarchy of divisions and subdivisions.